There is more to the college soccer recruiting process than simply performing well on the soccer field. The truth is that both women’s and men’s college soccer teams at the NCAA D1, D2, or D3 levels have a lot of prospective soccer players to select. Depending on the college and NCAA division, you can be competing with hundreds of recruits for only 4 – 10 roster spots per team. This means that as a prospective student athlete, it can’t be stressed enough how important it is to be proactive and assertive in the college soccer recruiting process. Almost every college soccer team in NCAA Division 1, 2 and 3 has a soccer questionnaire that is available for prospective students to fill out on their team website. A completed questionnaire allows potential recruits to put themselves in the college coach’s system of communication. Once you have identified the college soccer programs of your choice, go to their websites and fill out their soccer questionnaires immediately. The earlier, the better. This action will alert college soccer coaches that you are indeed interested in their soccer program and supply them with the correct contact information for when their staff is attending tournaments, hosting clinics or camps, and having visitation days. This is extremely important and can be a great asset in the college soccer recruiting process. With so many prospective student athletes and so few college soccer coaches, it is almost impossible for coaches to make it out to see everyone play across the USA. A soccer highlight video will give the coach a chance to see you play early in the recruiting process and could put you on the short list for that team. Coaches will rarely make a trip out to see one individual player play so in many cases a highlight video is your way of getting your foot in the door. I have heard many college coaches explain it this way, “a soccer highlight video is a lot like a movie trailer, you never go see the movie unless you have watched the trailer first.” Attending a Future 500 ID Camp and selecting the ‘Film’ option will get you professional quality clips, shot from elevation, to use to make a great highlight video. Step 3. Give Coaches your showcase tournament schedule (every time). Let coaches know what soccer tournaments and showcases you are playing in. Coaches have limited resources and need to prioritize what tournaments to go to and who they will be seeing. Factor yourself into the coach’s decisions by giving them your soccer schedule early on in the process. It will increase the likelihood of them seeing you play if they are already going to the tournament. Curious about how Future 500 ID Camps compare to showcase tournaments? Read more on our latest blog! If you are not diligent about responding in time and/or following up to the college coach, he/she may think you are no longer interested in his/her college. On the other hand, not getting an email back from the college coach in a timely fashion or not getting one back at all does not necessarily mean that he/she is not interested. College coaches sometimes get over a hundred emails a day, so make sure you follow up. Persistence makes you more visible and shows that you are interested in the college. 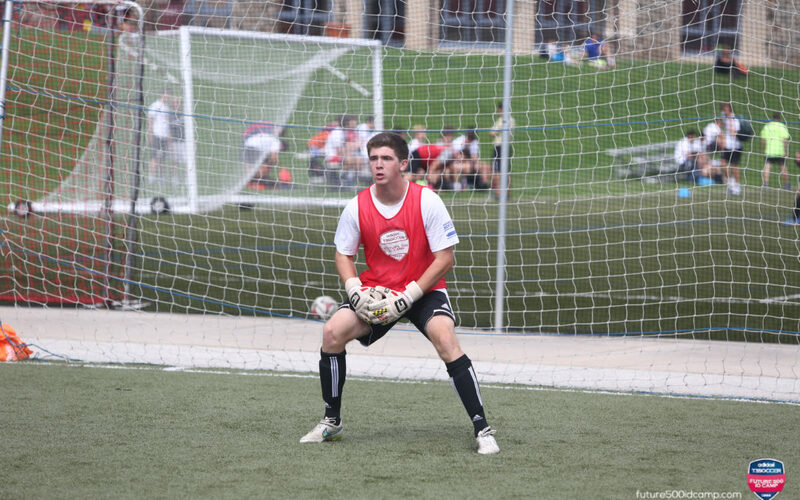 College soccer id camps are a very popular way for coaches to identify potential recruits. With so much going on during the year, many college coaches will utilize a popular summer ID camp to energize their recruiting pool. In contrast to a showcase tournament, the reason soccer ID camps are so popular is because it gives coaches the ability to watch players in different settings over a 2 to 4 day period. Coaches can see players play in a number of different situations, try them out in different positions, and see how they fit into different formations. Coaches like to be able to see players in different positions to understand if the recruit is able to adjust. Future 500 has three camps each year, with each featuring more than 75 coaches. These coaches are a mix of top D1, D2 and D3 coaches. The number and variety of coaches results in the most effective exposure opportunity for players of different levels of ability. In fact, in 2018 93.4% of the coaches that attended Future 500 contacted multiple players identified from camp. Find out more about how Future 500 greatly assists your process, through 5 key features, here. As you get further along in the process of communicating with a college coach, it is important that you (not your parents) stay on top of it. This means responding to their emails in a timely manner and filling out whatever forms or paperwork they request. This is important because at the end of the day, coaches look for more than just talent on the field. They want responsible, mature adults that will represent their program well. Additionally, most coaches want to see YOU personally communicating with the them. For many college coaches constant communication from parents is a “red flag” and will make you a less attractive recruit. Grades matter in the college soccer recruiting process. Period. At the end of the day you cannot forget that you are still a STUDENT-athlete. Although many player are enamored with the “full-ride” dream, the reality is academic scholarships are more prevalent and easier to attain than athletic scholarship. Having a high GPA makes you more attractive to college coaches because better students may require less scholarship or less admissions involvement from the college coach. In many cases college coaches need their incoming class to have an average GPA that reaches the school’s standards in order for the coach to push his/her class through. The more selective the academic school and the harder a coach has to push for you, the less likely he is to offer you a roster spot. FOR MORE ASSISTANCE & INFORMATION ON EVERY ASPECT OF THE COLLEGE RECRUITING PROCESS, VISIT ATHLETE COLLEGE ADVISORS.